Tucked away in a cosy corner of Duo Galleria sits Cast Iron. 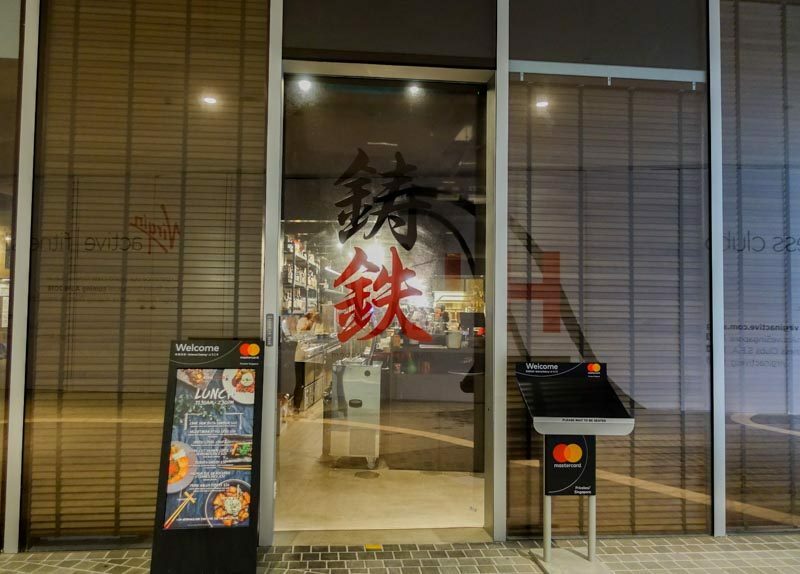 This modern Japanese restaurant is a stone’s throw from Bugis MRT station and was a little hard find while navigating through the new complex. Nevertheless, I caught sight of the black and red characters that made up Cast Iron’s Japanese name, flanked with wooden blinds covering the restaurant’s large glass panels. 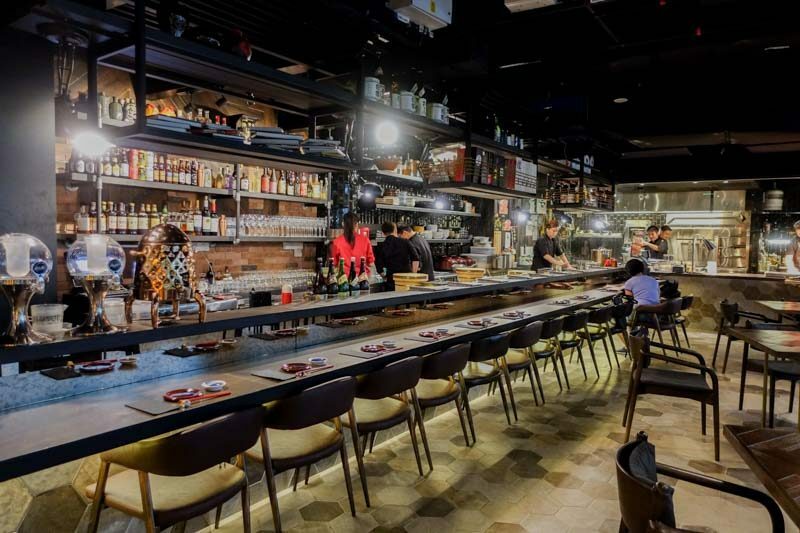 This snazzy joint serves up a wide range of delicate Japanese fare to Western grills and also boasts a pretty impressive beer and sake menu too. The restaurant is furnished in black and dark wood colours, with a unique honeycomb-shaped tiled floor design. We were shown to our seats by the bar, where we got to get up close and personal with the chef who was serving our omakase meal. We started with the affordable Sake Set ($20), which came with a flight of three types of sake. 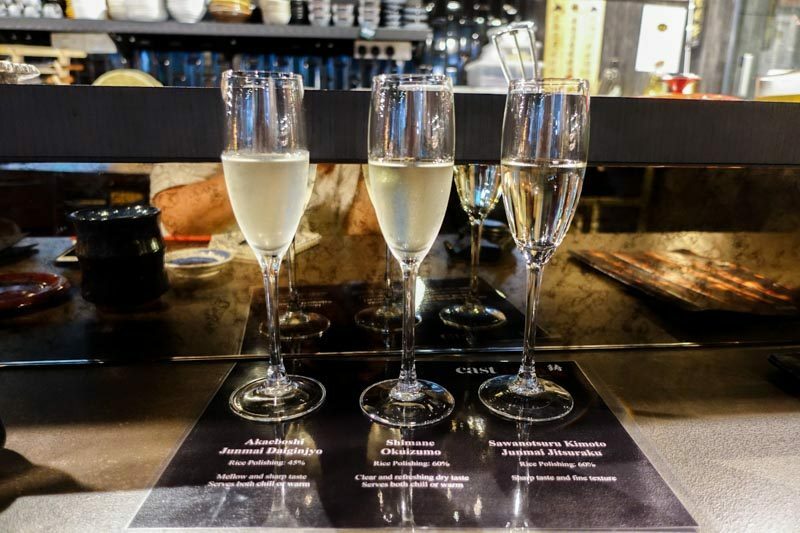 The glasses were set on a laminate printed with the individual names of the sake and tasting notes for each. A great and value-for-money choice for those who want to try different types of sake with your meal or those who want to dip their toes into sake appreciation. We went for the Tetsu-Ryu ($180 per pax) omakase set, which featured the chef’s selection of sushi, sashimi, grilled items, soup and dessert. First up was the incredibly unique Oyster Oil Zuke “Confit”, featuring a sizeable oyster from Japan’s Miyagi prefecture, that had been confitted for three weeks in salad oil. 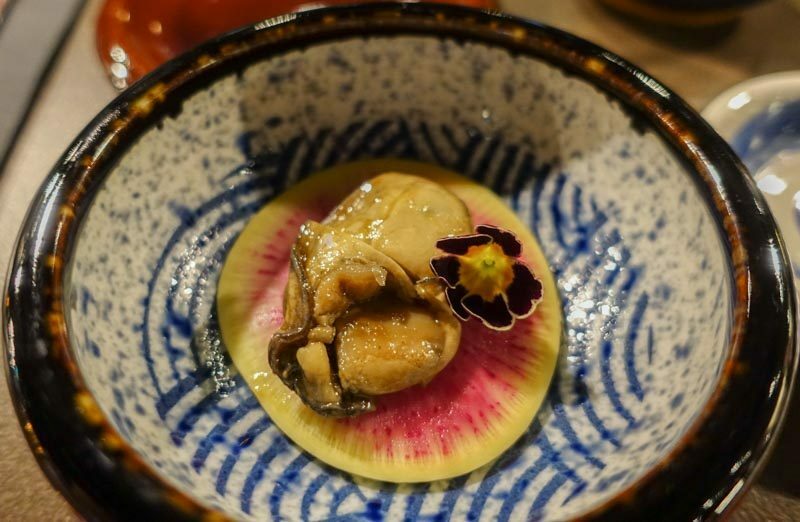 Set upon a pretty slice of red radish from Kyoto, the oyster was very savoury and its texture kind of reminded me of a firm shiitake mushroom. The aftertaste of the oyster was clean and slightly briny, truly a dish that you need to experience for yourself. The second dish consisted of two types of sashimi: Baby Bluefin Tuna and line-caught Mackerel. 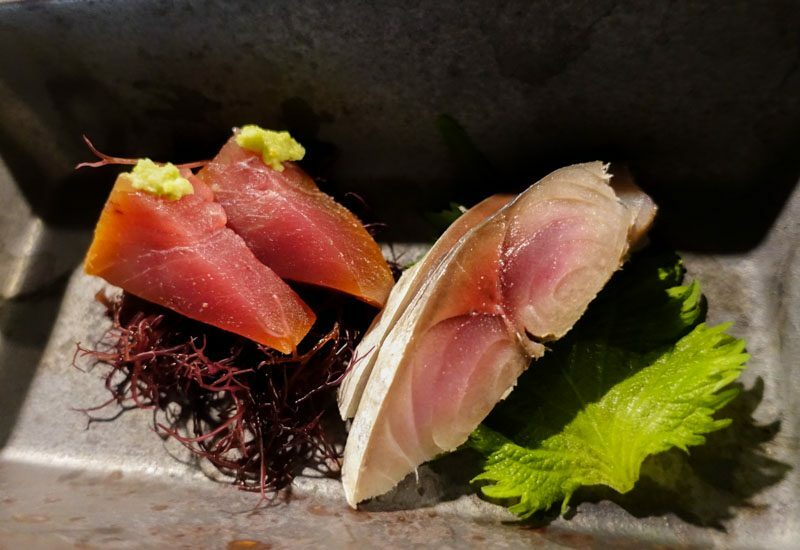 Chef Anson Lim explained that the tuna had been aged for five weeks, and dabbed with a speck of fresh wasabi to bring out the depth of flavours. Whereas the mackerel is line-caught instead of being fished up in a net, ensuring less bruising from occurring in the fishing process. The aged tuna took on a rich, savoury taste and paired well with the sweet, spicy wasabi. With the ageing process breaking down the proteins of the fish, the meat was tenderized without tasting sinewy. The mackerel was extremely fresh and had a dense texture. There was a slight mineral taste while chewing on the meat, and left little to no fishiness on the palate in the aftertaste. This was one of my most memorable and favourite dishes out of them all. The Hamaguri Clam was tossed together with finely diced Japanese mountain yam and egg yolk. This yam, also known as nagaimo, is a sticky mountain yam commonly used in salads. 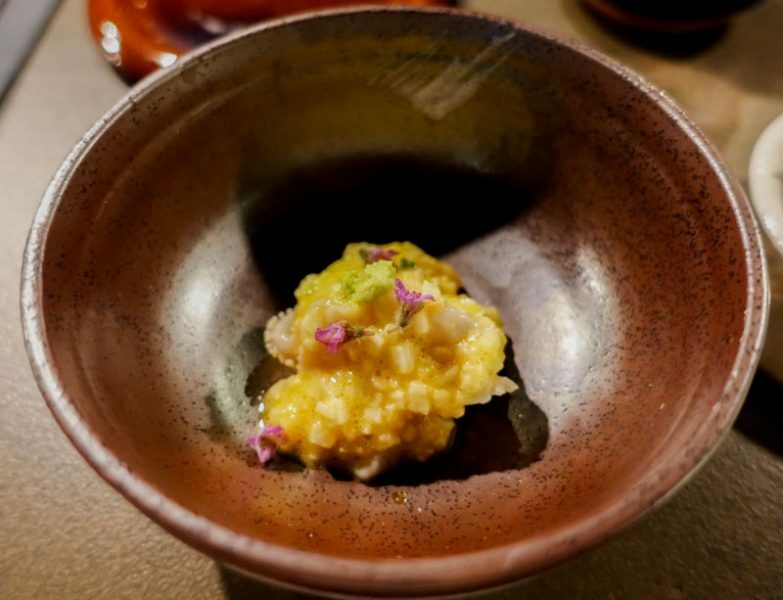 When mixed together with the fresh clam and egg yolk, it developed a viscous texture that reminded me of Japanese natto. Sweet and mild in taste, this dish gets a bright pop of flavour from the pink shiso flowers. 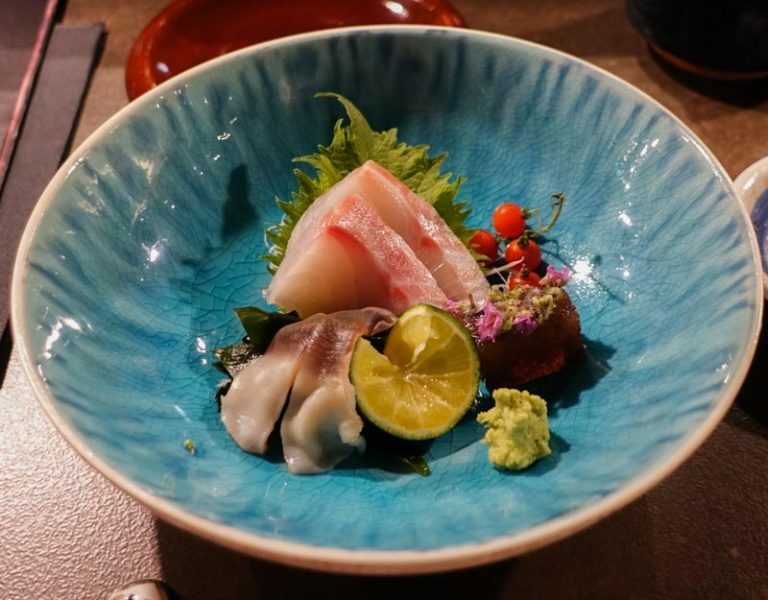 The next part of the sashimi dishes featured the Stone Sea Bream and Hokkaido Surf Clam, served in a beautifully garnished bowl. I’m not a fan of surf clam, but the wild-caught stone sea bream was sweet and clean-tasting. It was also served with a soft, spongy jelly made from the Sterculia plant; something that I’ve never seen on a menu before. The jelly was quite tasteless, and its texture reminded me of white fungus that you get in cheng tng. The next part of the meal consisted of grilled dishes. 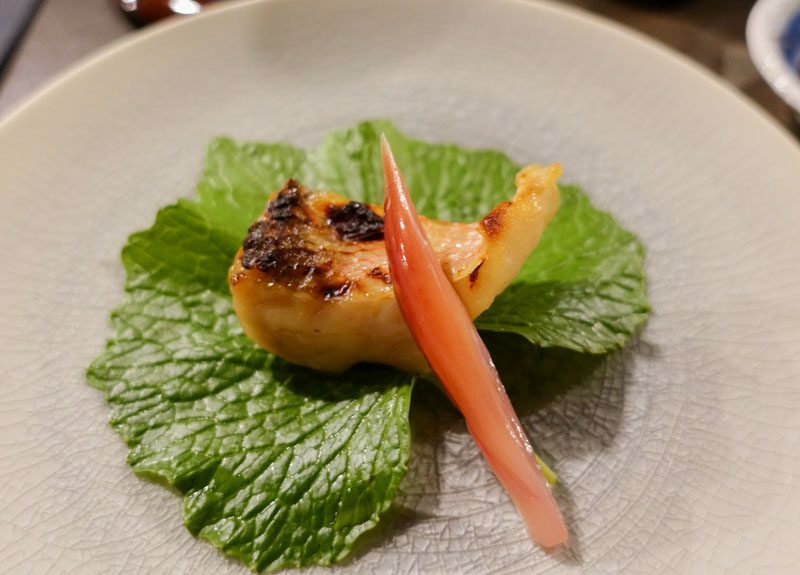 The grilled Amadai Fish from Shizuoka was placed atop a wasabi leaf, and garnished with a a pickled ginger flower. The meat was extremely dense and flaky, its savoury taste coming from four days of marinating in mixture of miso and sake. There is also a light, lingering alkali aftertaste, which I couldn’t quite put my finger on where it came from. Either way, it made for a very pleasant grilled fish dish. 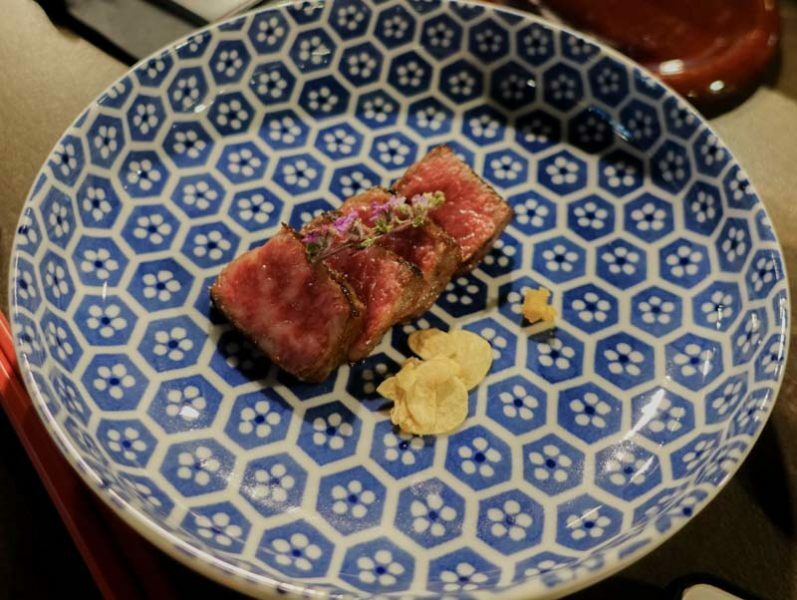 This was one of the highlights of the meal, a phenomenal portion of one and a half month-aged Miyazaki Beef, served with fried garlic flakes and a dab of yuzu kosho. From the incredible sear on the outside to the delicate marbling of the pink rare centre, every bite was utterly enjoyable. In my opinion, this tasted better than Kobe beef. I almost had to excuse myself for a moment alone with this incredible plate of heaven. 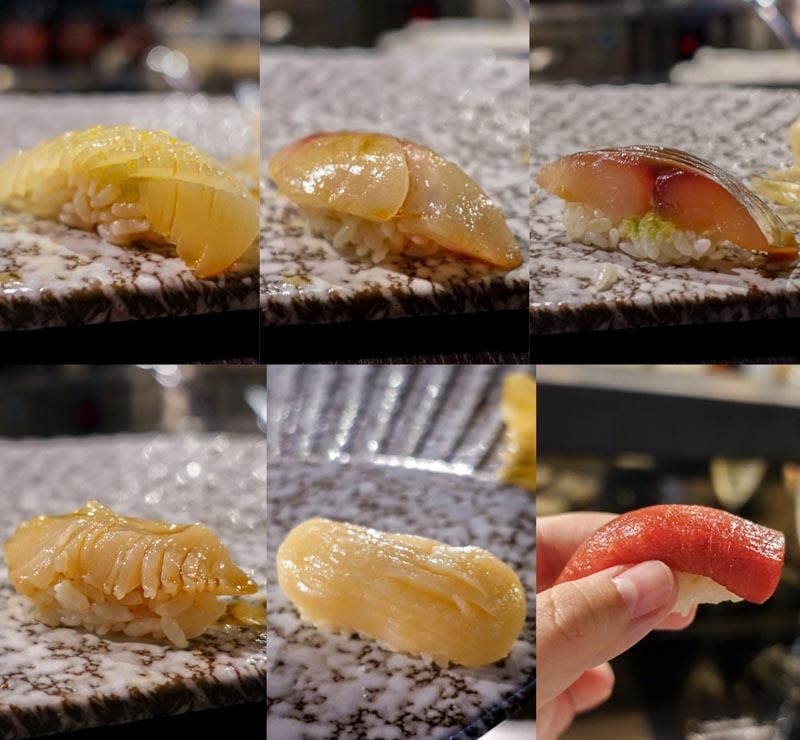 The omakase’s sushi line up was nothing less than stellar. A few that stood out were the Noro-kuro, aka Black Neck Fish, a famous feature in most high-end Japanese restaurants. 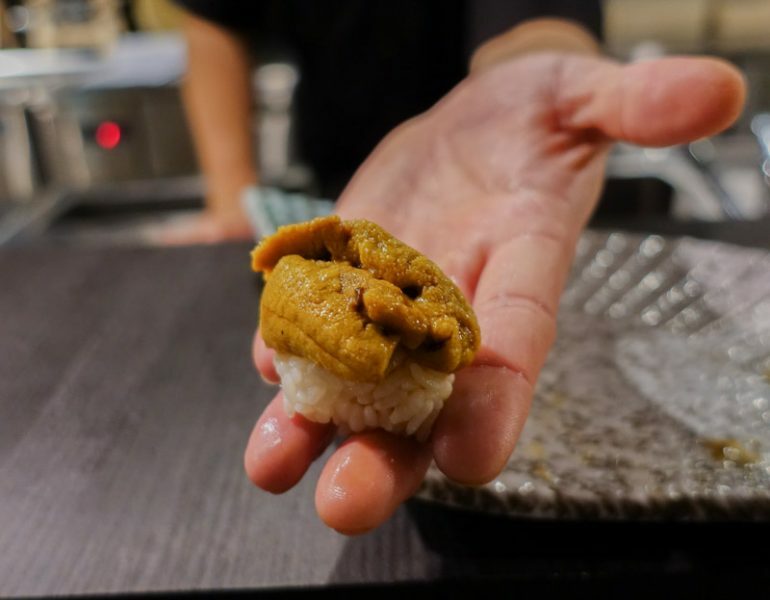 Chef Anson insisted that we picked up the Uni sushi straight out of his hands as it would be a hassle picking this large, almost rice ball-sized up using chopsticks. The taste was utterly rapturous, making you feel not one, but all kinds of emotions at once. It was so buttery and bright, delicate and so rich, positively even regal. If you have never had an emotional experience with food, I’d say this is the dish that takes the cake. 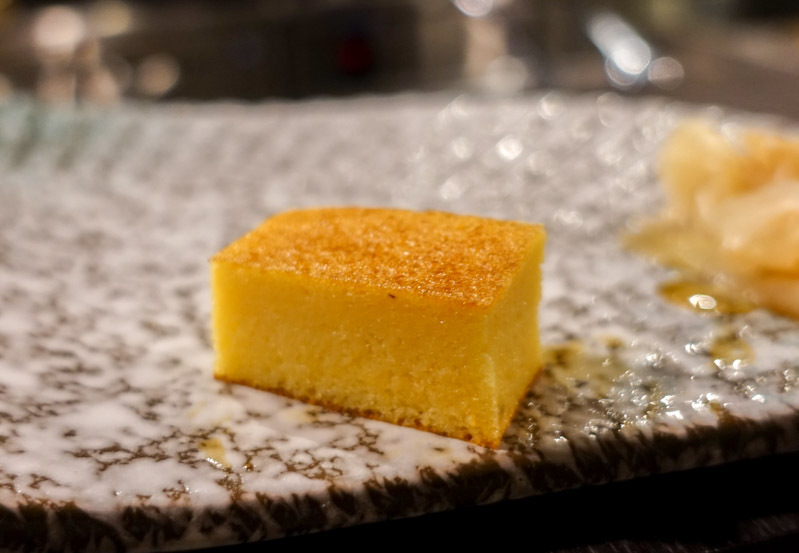 At the end of our sushi course, we were served a small slice of Homemade Spongecake. It was very dense and moist, more omelet-like than spongecake, with a rich eggy aroma. A great end to our sushi course. 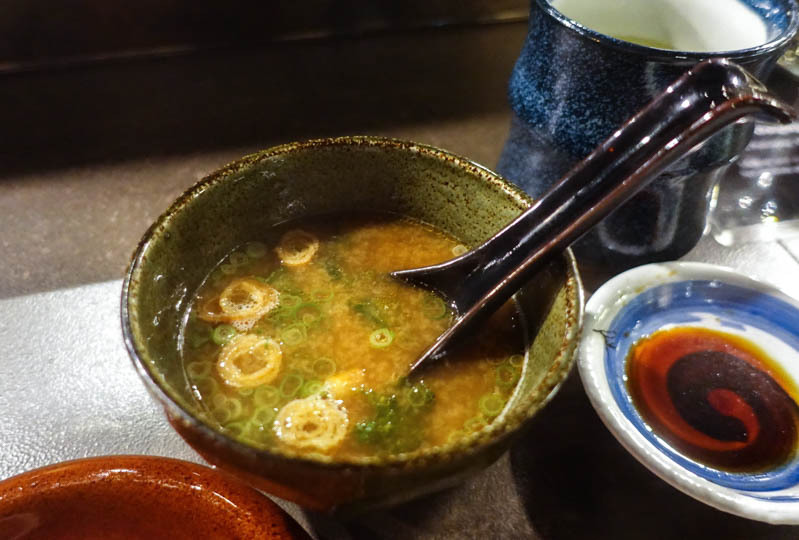 We were also served a special Collagen Soup, made in-house daily by boiling assorted fish bones from the catch of the day, along with Japanese wheat miso. I wasn’t a fan of this soup as it was too fishy for my liking. My dining partner however, enjoyed this hearty broth down to the last spoonful. 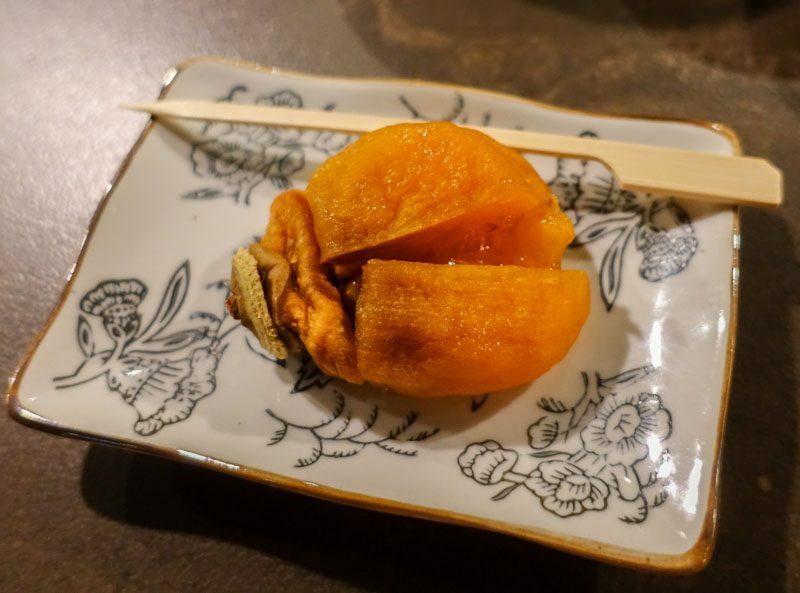 To end off our meal, Chef Anson served us the Winter Persimmon, one of the last of its season as winter is coming to an end. The outside of the fruit is caramelised from the gentle heat of the winter sun, while the inside has been reduced to a sugary jam-like texture. I’m not normally a fan of persimmon, but this dish was unlike anything I’ve tasted before. From the saccharin sweet bite that I took, it’s hard to believe that this fruit has been purely sun-dried and not processed. This was my first time having omakase outside of Japan, and Cast Iron has definitely lived up to its standard by giving me an experience close to what I had back in the Land of the Rising Sun. From the first dish to the last, everything came together in perfect harmony. My experience at Cast Iron marked a nice end to a busy work week.